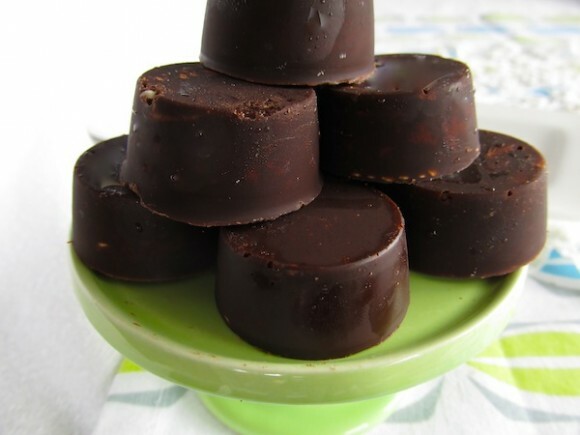 A simple, yummy but healthy chocolate (candy) recipe. Melt the coconut oil and add the honey. It must just be warm enough to melt the coconut oil and no hotter. Whisk and add the vanilla and cocoa powder. Be very careful not to overheat the mixture or you will end up cooking or burning the cocoa powder. Whisk occasionally while pouring into a silicone ice cube tray or silicone mini muffin tray. If you wish to diversify, before you fill the moulds, you can first place a few assortments, like crushed peanuts or almonds, flakes of dried coconut, raisins, berries or other delights. Cool for 15 to 30 minutes in the fridge or freezer, depending on how hot the coconut oil was when you started. If the oil is only just reached its melting stage, then it will set quicker..